I grew up in three German towns that shaped my interest in medieval literature and religion: Münster, Lüneburg and Nürnberg. I then studied Germanistik, History of Art and Theology in Bamberg, Edinburgh, Berlin and Göttingen. My PhD explored the late medieval literary network of Nürnberg. I followed my Doktorvater Professor Christoph Huber to the University of Tübingen where from 1995 to 2006 I taught a variety of courses on medieval German language and literature ranging from Advanced Gothic to Early Print Culture. During that time I gained a Venia Legendi (the right to lecture) in German Philology for my book on the history of the Book of Judith in the Middle Ages and edited an 11th century bilingual commentary on the Song of Songs by Williram of Ebersberg. During these years I spent a year at Oxford on a Humboldt foundation scholarship working with Professor Nigel F. Palmer (2001/2) and held a Visiting Professorship at the University of Zürich centred around manuscript studies (2005). In 2006, I came to the UK as Chair of German Studies at Newcastle University where my current research projects took shape: the religious landscape of the 15/16th Lüneburg area, particularly the manuscripts produced by the nuns in Medingen. Working there also afforded the opportunity to start shared projects with British German medievalists and the wider field of Modern Languages, e.g. with Women in German Studies (Chair of WIGS 2009-2015). In Oxford, I am currently working on several projects linked with the Northern German convents, e.g. the Gerda Henkel Stiftung funded project to edit the letters of the nuns from Lüne, and the edition of prayer-books from the Abbey of Medingen. A major theme is the engagement with the Reformation. My second “Standbein” is Freiburg im Breisgau where I am a Senior Research Fellow at the FRIAS. This is made possible by the generous co-funding of the Chair by the VolkswagenStiftung, the DAAD, and the University of Freiburg. I am currently supervising graduate students on a range of topics, from History of the Book to mysticism, and from Middle Low German to early modern bilingualism, and am happy to consider requests for supervision over the medieval and early modern period, especially projects with focus on manuscript studies, the intersection of visual and textual culture and Latin-German bilingual writing. There is a very well established lively community for graduate students which includes regular colloquia and exchanges with Bonn, Freiburg, Fribourg and Geneva. 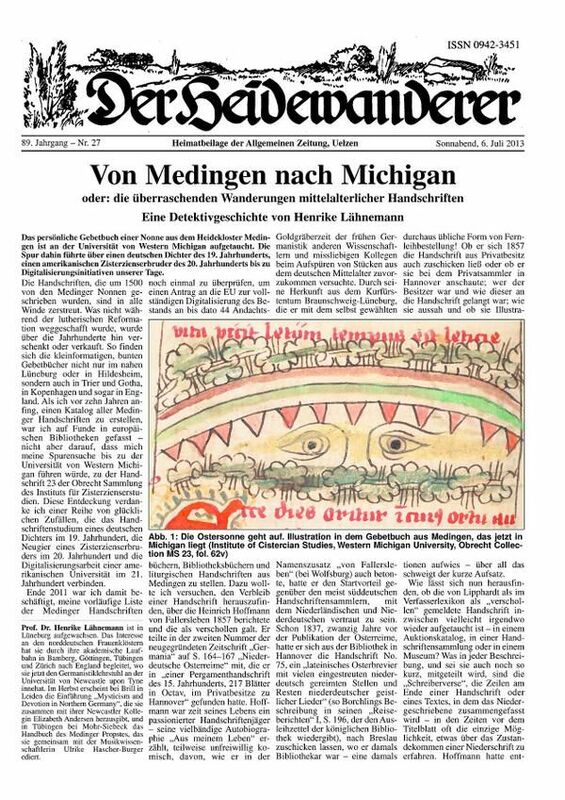 Article by/Besprechung von Angelika Overath, in: NZZ vom 26.03.05, Beilage ‘Kunst und Literatur’, p. 46. Chapter on the edition (“Anhang VI: Zur neuesten Williram-Ausgabe) in Niels Bohnert: Zur Textkritik von Willirams Kommentar des Hohen Liedes. Mit besonderer Berücksichtigung der Autorvarianten, Tübingen 2006, p. 245-247.
Review by/Rezension von Helen Watanabe-O’Kelly, in: MLR, 103.2 (2008), p. 575-576. (together with Eva Schlotheuber) Netzwerke der Nonnen. Edition und Erschließung der Briefsammlung aus Kloster Lüne, vol. 1 , Tübingen: Mohr Siebeck in press. Open access edition of the letters (introduction, facsimile, diplomatic transcription, critical edition and commentary) in the Digital Library of the Herzog August Bibliothek Wolfenbüttel. ‘Encomia-Deutsch’. Sonderheft der deutschen Sektion der International Courtly Literature Society, Tübingen 2000, ed. by Christoph Huber and Henrike Lähnemann (full text as pdf available). Dichtung und Didaxe. Lehrhaftes Sprechen in der deutschen Literatur des Mittelalters, Berlin 2009, ed. by Henrike Lähnemann and Sandra Linden. Introduction ‘Was ist lehrhaftes Sprechen?’, p. 1-10. The full volume is accessible free of charge. Review by/Rezension von Lawrence M. Mills, Journal of Biblical Literature (2011), who has described The Sword of Judith as “a quantum leap forward” in Judith studies. Review in ‘Nashim: A Journal of Jewish Women’s Studies & Gender Issues’, Number 24, Spring 5773/2013, pp. 146-148 by Amy-Jill Levine, writing about our introduction to the Christian section: “Striking (sometimes literally) observations abound”. Companion to Mysticism and Devotion in Northern Germany in the Late Middle Ages, ed. by Elizabeth Andersen, Henrike Lähnemann and Anne Simon (Brill’s Companions to the Christian Tradition 44), Leiden 2013 (Introduction: Mysticism and Devotion in Northern Germany, pp. 1-19). View the Table of contents and read the introduction (pre-print version). German Manuscripts in Oxford’. In Honour of Nigel F. Palmer’, Oxford German Studies, Vol. 46, Issue 2 (2017). Lehren, Lernen und Bilden. XXIII. Anglo-German Colloquium, ed. with Nicola McLelland and Nine Miedema, Tübingen 2017. 1: Martin Luther. Sendbrief vom Dolmetschen (2017). 2: Martin Luther. Sermon von Ablass und Gnade (2018). 3: Passional Christi und Antichristi (in press). Die Erscheinungen Christi nach Ostern in Medinger Handschriften, in: Medialität des Heils im späten Mittelalter, ed. by Carla Dauven-van Knippenberg, Cornelia Herberichs, and Christian Kiening, Chronos 2009 (Medienwandel — Medienwechsel — Medienwissen 10), pp. 189-202. Der Auferstandene im Dialog mit den Frauen. Die Erscheinungen Christi in den Andachtsbüchern des Klosters Medingen, in: Passion und Ostern in den Lüneburger Klöstern, ed. by Linda Maria Koldau, 2010, pp. 105-134. Published version. “Medinger Nonnen als Schreiberinnen zwischen Reform und Reformation” and “V.28 Ornat für eine Engelsskulptur”, in: Rosenkränze und Seelengärten. Bildung und Frömmigkeit in niedersächsischen Frauenklöstern, ed. by Britta-Juliane Kruse (Wolfenbüttel 2013), pp. 37-42 (paper open access); pp. 319-320 (order the catalogue). Saluta apostolum tuum. Apostelverehrung in Kloster Medingen, in: Weltbild und Lebenswirklichkeit in den Lüneburger Klöstern. IX. Ebstorfer Kolloquium vom 23. bis 26. März 2011, ed. by Wolfgang Brandis and Hans-Walter Stork, Berlin 2015, 41-64. ‘Lübeck’, in: Europe: a Literary History, 1348-1418, ed. by David Wallace, Oxford 2016, 596-610. The Materiality of Medieval Manuscripts, in: Oxford German Studies 45 (2016), 121-141. Der Medinger “Nonnenkrieg” aus der Perspektive der Klosterreform. Geistliche Selbstbehauptung 1479-1554, in: 1517-1545: The Northern Experience. Mysticism, Art and Devotion between Late Medieval and Early Modern. Antwerp Conference 2011, ed. by Kees Scheepers et al., Ons Geestelijk Erf 87 (2016), pp. 91-116. Das Erfurter ‘Enchiridion’ in der Goslarer Marktkirchen-Bibliothek, in: Marktkirchen-Bibliothek Goslar. Beiträge zur Erforschung der reformationszeitlichen Sammlung, ed. by Helmut Liersch, Regensburg 2017, pp. 232-243. Introduction, in: Martin Luther, Sendbrief vom Dolmetschen (Treasures of the Taylorian. Series One: Reformation Pamphlets 1), ed. Howard Jones, and Henrike Lähnemann (Oxford: Taylor Institution Library 2017), pp. vi-xiii. From devotional aids to antiquarian objects. The prayer books of Medingen, in: Reading Books as Cultural Objects, ed. Evanghelia Stead, Palgrave 2018, pp. 33-55. The Taylorian Copies: Production, in: Martin Luther. Sermon von Ablass und Gnade (Treasures of the Taylorian. Series One: Reformation Pamphlets 2), ed. Howard Jones, Martin Keßler, Henrike Lähnemann, and Christina Ostermann (Oxford: Taylor Institution Library 2018), pp. xxxix-lii. Verhüllte Schrift. Pergamentmakulatur aus den Lüneburger Klöstern, in: Codex und Material, ed. by Patrizia Carmassi and Gia Toussaint (Wolfenbütteler Mittelalter-Studien 34), Wiesbaden 2018, pp. 119-135. Handschriftenproduktion im Kloster. Das Beispiel Medingen, in: Schatzhüterin. 200 Jahre Klosterkammer Hannover, hg. von Katja Lembke / Jens Reiche, Dresden 2018, pp. 182-187. Armbrust und Apfelbaum. Eine lateinisch-niederdeutsche Hoheliedauslegung (Mscr.Dresd.A.323), in: Gedenkschrift Christoph Gerhardt, ed. by Ralf Plate, Münster (Aschendorff, in press). Biblische Geschichte für den Druck. Die Vier Historien (Bamberg 1462), in: Anglo-German Colloquium (Manchester 2017), ed. by Sarah Bowden, Stephen Mossman, Manfred Eikelmann, Michael Stolz (Francke, in press). Review of/Rezension zu: Wells, David A.: The Central Franconian Rhyming Bible (“Mittelfränkische Reimbibel”). An Early-Twelfth-Century German Verse Homiliary. A Thematic and Exegetical Commentary. With the Text and a Translation into English. Amsterdam/New York, NY, Rodopi, 2004, XVI, 359 p. (Amsterdamer Publikationen zur Sprache und Literatur 155), Germanistik 45 (2004), p. 745. Review/Rezension zu: Riedel-Bierschwale, Heike: Das ‘Laiendoctrinal’ des Erhart Groß. Edition und Untersuchung, Münster [u. a. ]: Waxmann 2009, in PBB 134 (2012) pp. 143-146.